In his speech, Mr Macron also called for an EU tariff on goods imported from countries or companies that do not share its climate goals, and pledged to work to raise the cost of carbon within the EU to €30 a tonne. 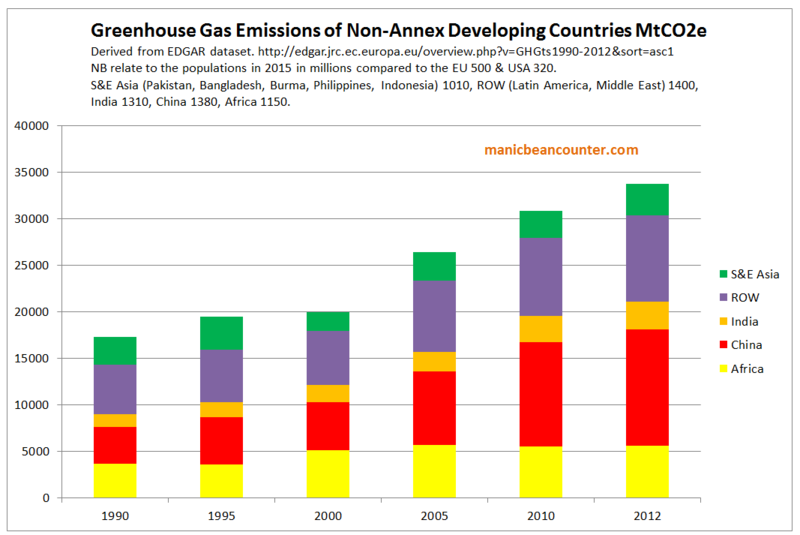 Most INDC submissions do not state they will reduce their greenhouse gas emissions. As a result, even if the proposals are fully met (and the EU is unlikely to meet its target) then emissions are forecast to be higher in 2030 than they are today. This graphic from the UNEP Emissions Gap Report published at the end of October demonstrates the situation quite nicely. So President Macron is wanting sanctions not just against the USA, but most of the world as well? This includes China, India, nearly every African country, most countries in SE Asia, the Middle East nations and some other nations besides. Or is it just those who stand up to the useless European climate policies, that are benefiting large businesses with subsidies financed disproportionately by the poor? The rhetoric includes “companies”, on whom sanctions cannot be applied. Further, the €30 carbon price is equivalent to €0.10 on the price of petrol (gasoline). How is a small rise in the cost of fossil fuel energy from a group of countries with less than 10% of GHG emissions going to save the world? As economics Professor Richard Tol has estimated, to achieve the targets would require a global carbon tax from 2020 of $210 and then escalated by 4-6% a year until fossil fuels were unaffordable. Chancellor Angela Merkel claims “Climate change is by far the most significant struggle of our time.” (Independent again). The falsity of this claim is shown by political newcomer President Macron’s trying to marginalize and silence opponents with empty and ineffectual threats. 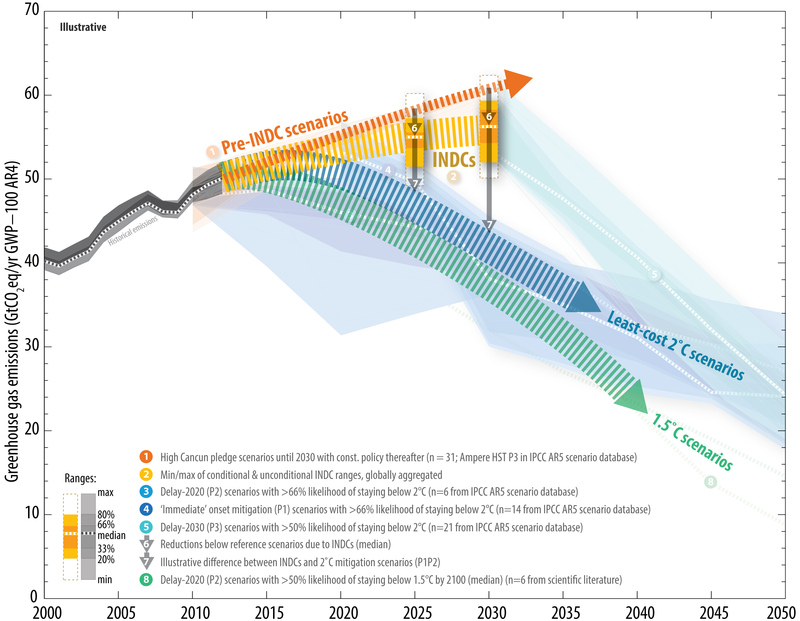 Whereas even with the all the vague policy proposals fully implemented global emissions will be about 10% higher in 2030 than in 2010, the 2C pathway has emissions 10-30% lower. That means a carbon tax of $210/tCO2 (now £170) would have to turn around the global relentless rise in emissions and have them falling rapidly. I am deeply sceptical that such a global policy would achieve anything like the that difference would be achieved even with an omnipotent, omniscient, and omnipresent planner to impose the tax. The reasons for that scepticism can be found by applying the tax to real world examples. First let us apply a £170/tCO2 carbon tax to petrol, which produces 2.30kg of CO2 per litre. With 20% VAT applied is equivalent to 47p a litre added to the retail price. (Current excise duties with VAT are equivalent to £300/tCO2, the diesel £250/tCO2). For a car doing 15000 miles at 39mpg, this would generate an additional cost to the owner of £820 per year. Maybe a 15-30% increase in the full costs of running a small car in the UK. There is plenty of empirical visence of the effect of the oil price movements in the last couple of decades (especially in the period 2004-2008 when the price increased) to show that costs increases will have a much smaller effect on demand, whereas for the carbon tax to be effective it would need to have a much greater impact than the percentage cost increase. Second, let us apply a $210/tCO2 carbon tax to coal-fired power stations. They produce about 400kg of CO2 per megawatt, so the cost would rise by $84MWH. In China, coal-fired electricity will retail at less than $30 MwH. China would rapidly switch to nuclear power. Even so, its power generation emissions might not start falling for at least a decade. Alternatively it might switch to gas, where the carbon tax would be half that of coal. However, there is another lesson from oil prices, this time over the last three years. A small fall in demand leads to large falls in price, in the short term. That is the market responds by offsetting the cost of the global carbon tax. To use terms of basic economics the demand for fossil fuels is highly inelastic with respect to changes in price, and the supply of fossil fuels in the short term is highly inelastic to changes in demand. 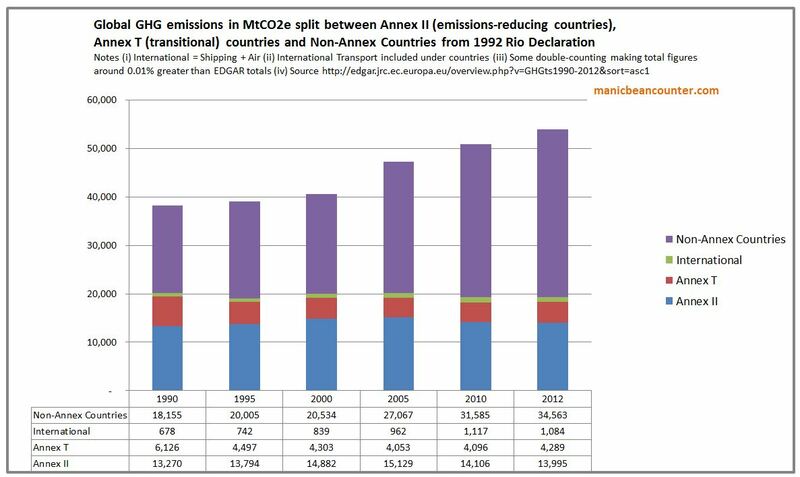 Emissions reductions policies have not just turned out to be pretty useless in practice, they are pretty useless in theory (with real world political constraints removed) as well.